Back in October I had the pleasure of attending the ITS Tactical Muster, during which I learned several awesome manly skills. My favorite tutorial was on lock picking. Going into the lock picking session at the Muster, I assumed that it would be really hard to do and would take hours of practice to figure out. Yet within two minutes of getting a set of picks in my hand, I had successfully picked my first lock. Since coming home from the Muster, I’ve been regularly practicing my lock picking skills, and from time to time I’ll be offering a primer on how to pick various locks. We’ll start by taking a look at the most common lock used on front doors across the world: the pin tumbler lock. But let’s begin by discussing why you might want to learn the art of lock picking in the first place, as well as the legal issues involved with this great hobby. Lock picking opens your eyes to the “illusion of security.” We all lock our doors to keep our loved ones safe at night and to secure our possessions during the day. After I picked my first lock within two minutes of learning how to do it, I realized that locks don’t really do much except provide the illusion of security. Locks make us feel safe, but if someone really wanted to get in your house, they could easily pick the lock on your front door. If they didn’t know how to do that, they could find another way in. You can’t just rely on a lock to keep you and your family safe. You need to utilize other tools and tactics and create multiple layers of security. Realizing how little locks actually keep you and your stuff safe was both terrifying and surprisingly heartwarming. Terrifying because I saw that someone could easily enter my house and walk off with a crap-load of stuff without having to break a window; heartwarming because seeing how easy it is to pick a lock and yet how rarely people get burgled, made me realize that most people don’t break into homes because, well, most people are good people. It makes you handy. If you’ve ever been locked out of your house or car, you know how annoying it is to be standing there like a chump, waiting for someone to show up with a key or a professional locksmith to arrive. Wouldn’t you love to be able to jimmy your way in yourself? Not only can this skill save you a lot of time and money, being able to solve a problem like that on your own is pretty dang satisfying. Plus, you can help out all your friends when they get locked out too. Knowing how to pick a lock may even help you save a life one day. ITS Tactical has highlighted a few instances in which someone picked their way into an older parent’s home because they weren’t answering the phone, only to find their parent collapsed on the floor. Could they have kicked the door down or broken a window? Sure. But picking a lock just takes a few seconds and doesn’t leave any damage. So why wouldn’t you do that if you could? It’s cool and fun! There’s simply a “cool” factor of knowing how to pick a lock. Of all the Jason Bourne-esque skills every man wishes he had, it’s one of the most attainable. The idea that I can surreptitiously enter most doors without a key makes me feel all-powerful, like some sort of super ninja-spy. It’s also a fun little hobby and something I like to do when I’m taking breaks from work or hanging out with the kids while they do their kid thing on the carpet. If you get really into lock picking, you can actually go to events and contests to test your skills against other lock pickers. There’s a common misconception that the only people who can legally own lock picking tools are first responders or licensed locksmiths. The reality is that in most states, as long as you’re not trying to illegally enter someone’s home with your lock pick set, you can legally own, carry, and use lock picking tools. There are, however, some states that have laws that make owning lock picking tools prima facie evidence of criminal intent. If you’re caught with picks in these states and you want to avoid criminal charges, you have to prove that you didn’t plan on committing a crime. Long story short: owning lock picking tools and learning how to pick locks is perfectly legal and ethical as long as you do so without nefarious intent. Just be a decent human being. For a summary of lock picking laws across the country, see here. Pin tumbler locks are the most common locks found on the front doors of homes. So it makes for a good first lock to learn how to pick. You don’t really need to understand how pin tumbler locks work to successfully pick them, but it does help. The basic design of the pin tumbler lock has been in use since 4000 BC. Of course, it’s gotten more complex over the millennia. The design that is used in most cylinder locks – like the one on your front door — has been around since 1861 and it hasn’t changed much. Basically most of the world is using a technology that’s been around for a century and a half to keep their most prized possessions safe and secure. Pin tumbler locks consist of an outer cylindrical casing (colored green) in which a plug is housed. The small gap between the outer casing and the plug is called the shear line. Remember that. It will come in handy here in a bit. The plug has an opening for the key. When the proper key is inserted into the plug, the plug can rotate, thus unlocking the lock. On top of the plug, a series of five or six holes are drilled. The holes contain key pins (colored red) of different lengths. They’re called key pins because they touch the key when you insert a key into the plug. Above each key pin is a driver pin that’s spring-loaded. When you pick a lock, all you’re doing is using tools, instead of a key, to line up the gap between the key pins and driver pins with the shear line between the outer casing and the plug. That’s it. And it’s super easy to do. Below is my wallet-sized lock pick set that I got from SEREPick while I was at the ITS Muster. The picks are made of titanium. There’s one tension wrench and several rakes with different numbers of ridges, which allow you to pick several pins at a time. There’s also a pick that allows you to pick one pin at a time. Some locks will require you to do that. SERE is out of stock on the exact set that I have, but they do have metal cards with the tools laser cut into it. Just keep the card in your wallet and when you need to pick a lock, pop out the tools and get a pickin’. If you’re looking for something a littler sturdier and robust, you can find lock picking sets several places online (even Amazon). If you want to be even more of a MacGyver, you could even make your own picks from a windshield wiper. 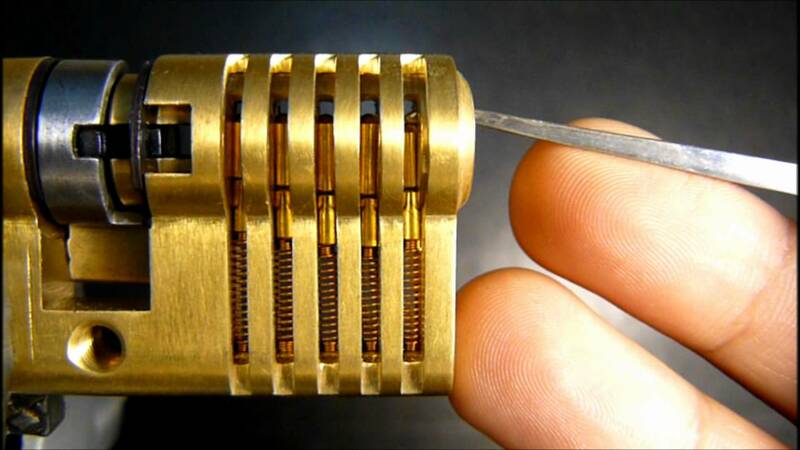 Lock picking is more art than science. You definitely have to develop a “feel” for it. Each lock is different, but the same basic principles apply. The easiest way to pick a lock is to use the fast and dirty method: scrubbing. The tension wrench is the key (no pun intended) to successfully picking a lock. Thanks to video games, people wrongfully think it’s the pick, because that is the thing that’s actually lifting the key pins to line up with the shear line. You’ll keep lifting pins with your pick and applying pressure with your tension wrench, until all the driver pins have cleared the shear line. So far so good? Alrighty. So take your tension wrench and place it in the bottom of the key hole. Apply slight pressure in the direction you would turn the key if you had it. And by slight I mean slight. If you apply too much pressure, you’re just going to cause the driver pins to bind below the shear line. You need to have enough give to let the driver pins rise above the shear line, but have enough torque that when they start dropping down, an edge of the drive pin catches the plug as it starts to rotate. How much is too much pressure? If your tension wrench is bending a lot, then you’re probably applying too much pressure. So lean on the side of applying less pressure than more. Pick your pick. I prefer the Bogota rake that has three ridges. This one has picked every lock that I’ve used it on very easily. Slide the rake all the way to the back. Keep applying torque on your wrench and scrubbing the pins until they all set. You may need to apply more torque and pressure on the pins with your pick as you get near the last one or two pins that need to set. If you’re not making any progress, you probably applied too much torque with the wrench. Relax, let the pins reset, and start over again, focusing on not using too much pressure. That’s it! Really. That’s all there is to it. You can successfully pick most pin and tumbler locks using this scrubbing method. You may run across locks that require a little bit more finesse by picking each pin set one at a time. In these trickier locks, you may need to get more methodical by looking for the pin stack that resists the most and picking it first and then repeating the process until all the pins are successfully picked. Like I said above, lock picking is more art than science. The best way to learn how to do it is to simply pick locks as much as possible. Buy yourself different pin and tumbler locks at the hardware store and keep them on your desk or by your couch. When you’re taking a break from work or while you’re watching TV, practice picking. I’ve got three or four locks in my drawer that I’ll bust out during the day for practice sessions.